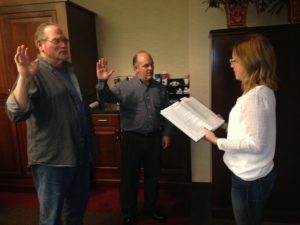 Bancroft residents Mike Borders and Rick Rittenhouse were sworn in as city commissioners during the city’s monthly meeting Thursday, Jan. 12. Borders, a 25-year resident of Bancroft, will serve as the commissioner for city maintenance. Rittenhouse, the city’s former ethics officer and a 16-year resident of Bancroft, will serve as commissioner of public services. To learn more about Mike Borders, click here. To learn more about Rick Rittenhouse, click here. In an additional move on the board, communications and community outreach commissioner Matt Tungate was elected mayor pro tem.